This is not my latest hobby, though I do really like it. 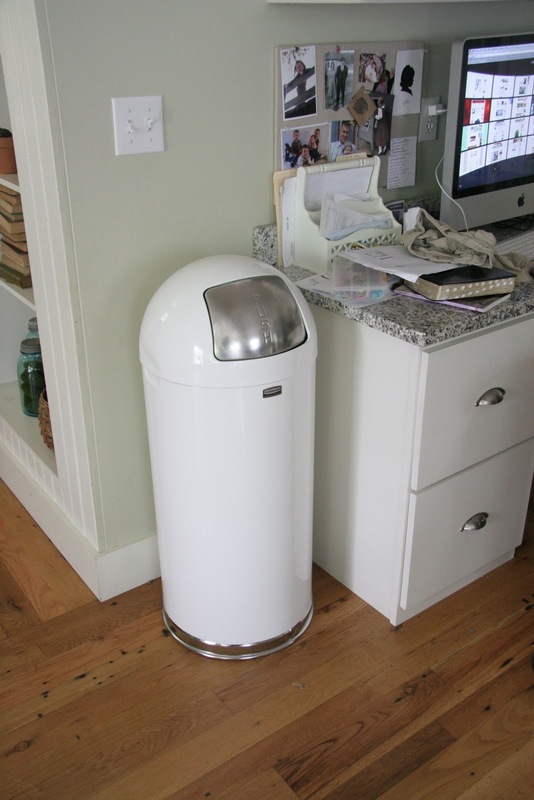 My old step trashcan had broken once again and so it was time to replace it. It was full of trash when we put it out with the rest of our trash to be picked up. I had to laugh when I went out a while later, instead of hauling it away, the trash man had carefully emptied it and left it for us. I guess he didn't realize we were throwing it away. I can only imagine what he was thinking, like, man, they are getting lazy, making me empty every trash can in the house. This new can was not cheap and when I unpacked it, I was disappointed to find a dent in the side. But customer service said to email pictures of the damage and they will send a new one, and the best part is, I don't have to return the old one. So after I get the new one, my husband will fix the dent in the old one and it should be as good as new. So, two for the price of one, not bad, I say! Now, this is my latest hobby - Spray painting furniture! Thanks to my sweet husband, I now have a hand held paint sprayer. And a corner in his shop to paint to my heart's content. He set all this up for me and I'm so excited about spray painting some furniture. This little rocker was stained a dark brown. Sorry I don't have a before picture but you get the idea. I can already see that spraying is so much faster than using a brush. I can hardly wait to get started on more projects but I have some house cleaning that will have to come first. Very nice trash can and awesome 2 for 1 deal even if not intentional hehehe. In "keeping it real" how realistic is to when you have to throw away the slimy, grimy stuff like meat packages and large milk and orange juice containers. Do you open the round lid or do you take the large items straight outside to the large trash can? Actually, the opening is larger than it looks. Milk jugs, juice containers, no problem. And I use 30 gal. trash bags inside it so messy stuff is okay.